This is chapter 3 of the User Guide for the Allegro CL 10.1 Integrated Development Environment (IDE). The problem with examples is that to be interesting, they have to do something interesting (to you, the reader) and anything that does something interesting needs some programming. The Allegro CL IDE is a tool for designing and implementing user interfaces to applications, along with a collection of tools which make the task of programming easier, but it does not write the underlying program (the part that actually does the work, often called the engine). We will discuss two examples in this chapter. First is a simple example where we make a form with two controls. We modify the event handler of one control so clicking on it prompts the user for a string and then displays the string in the other control. We show all steps and illustrate various windows and dialogs as we go. Second, we discuss the application created by the Interface Builder Tutorial. We do not discuss the steps of the Tutorial in detail. Rather we discuss aspects of the finished application. If you see a feature of interest to your needs, you know that information on implementing it can be found in the Tutorial. 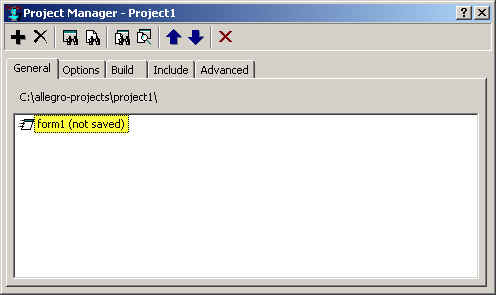 In this example, we create a dialog with a button and single-item-list. We will arrange it so that clicking on the button displays a dialog asking the user to enter some text that is then added to the items in the single-item-list. We got this configuration by opening a project and then choosing New Form from the File menu, specifying Dialog for the type of form. 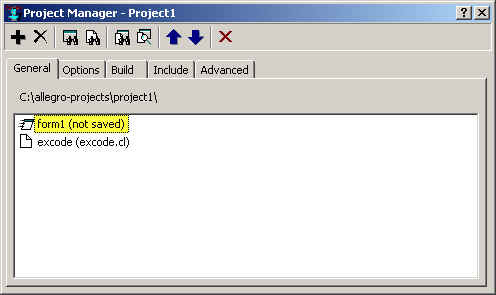 We were asked where we wanted the project files to be saved, and accepted the default c:\allegro-projects\project1\. (If you have used projects before, you may be using project2 or project3 rather than project1.) You should have a directory associated with the project. If we save files, we will save them here, as that makes cleanup easier. It is actually not necessary to save files for the first example, but if you do, it is best to place them is the project directory. Bring up the Apropos dialog by clicking Search | Apropos. Enter ask-user-for in the String box and click Search. 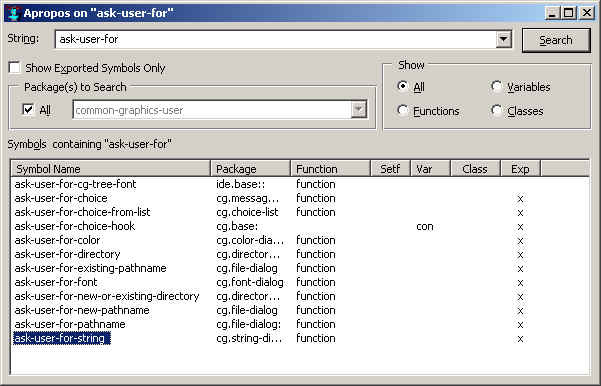 All symbols whose names start with ask-user-for are displayed; ask-user-for-string is at the bottom. Select it by clicking on it (it is selected in the illustration). Edit | Copy copies it to the clipboard. Back in the Untitled buffer, Edit | Paste pastes it into the buffer. Pressing F1 causes the help page for ask-user-for-string to be displayed. Now press `a'. The `a' choice, multiple-value-bind, is printed in the editor. Place the cursor just after the final parenthesis (or anywhere within the definition) and click Tools | Incremental Evaluation. You should see ask-for-string printed in the Debug window. That indicates that the function definition has been evaluated in the Lisp environment, as we want. Note that there are shortcut keys for most of the menu choices we have mentioned (typically Control-C for Edit | Copy, Control-V for Paste, Control-. for Symbol Completion, and Control-E for Incremental Evaluation). However, your editor mode may use those key combinations for editing operations making them unavailable as menu shortcuts. The shortcuts are shown in the menu. Use them in preference to the menu if desired and if they are not used by the editor. Now we can design our application window. We will work with the current project and form. Display the Project Manager window by clicking View | Project Manager. Now select the blank form. If it is not visible, click on (and so select) form1 (not saved) in the Project Manager and click on the View Selected Form button (shown in the illustration). The form should appear. The Inspector should be inspecting Form1. If it is not (or is not visible), double-click on the interior of the blank form. The Inspector, inspecting form1, will appear. 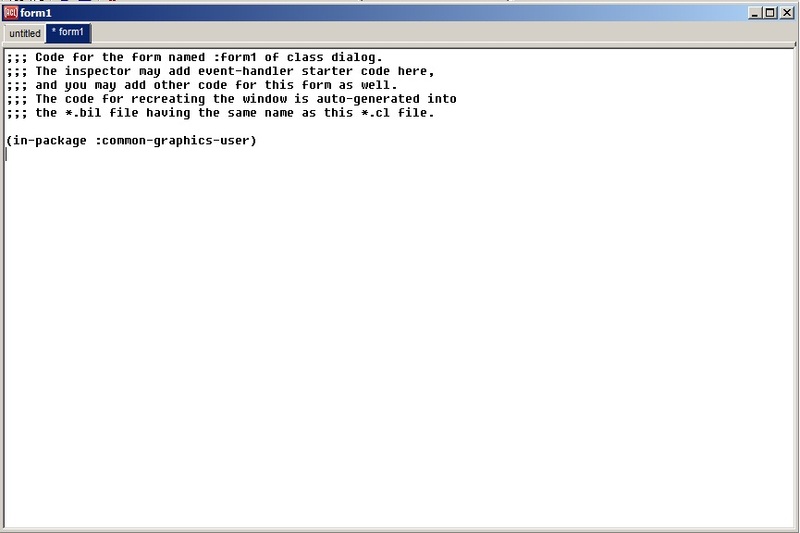 Also now display the code associated with form1 in an editor buffer. 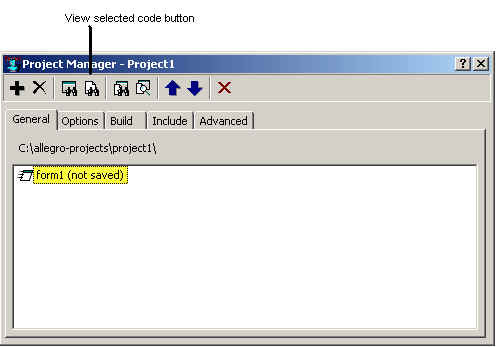 Do this by selecting form1 in the Project Manager dialog and clicking on the View Selected Code button. 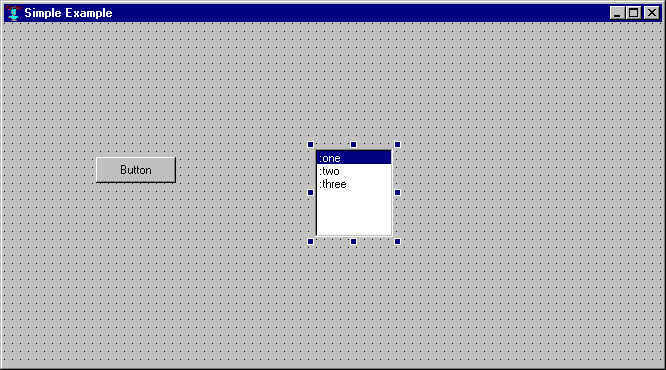 This will display an unsaved form1 buffer in the Editor Workbook. Add a single-item-list to the form. Click on the single-item-list icon on the Widget Palette and click on the form where you want it to go. We want to change the name and the range of the single-item-list. Select the single-item-list by clicking on it. Sizing handles (the solid squares) appear around the selected component, as in the illustration. 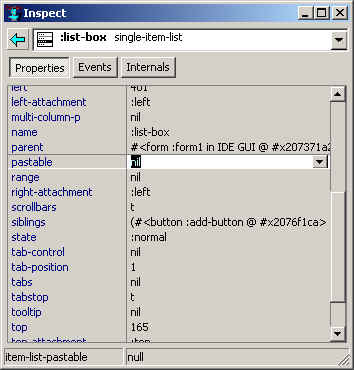 The Inspector window should now be inspecting the single-item-list component. Click in the name property, and type :list-box. Then click in the range field and type nil. Here is the Inspector after both changes have been made. Notice the single-item-list on the form is now blank (not illustrated). That is because we have set the range (the things displayed) to nil. In the application, when a user clicks the button, a dialog asking for a string will appear and whatever the user enters will become an item in the single-item-list. We want to specify the behavior when a user clicks on the button. When the user clicks, the on-change event handler for the button (if there is one) is called. We need a handler function that asks the user for a string and makes the result an item on the single-item-list. 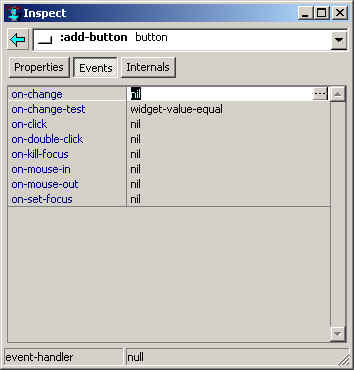 To modify the on-change event handler for the button, select the button and look at the Inspector. Click on the Events button and you will see the event handlers for the button. Actually, there aren't any  all the values are nil meaning all events are ignored (the on-change-test, the only item whose value is not nil, is an exception we do not discuss here). Click on the extended editor button  to the right, with the three dots -- for the on-change event. Since the button is on form1, your code is added to the source file associated with form1. For this case, you are placed in the form1 tab of the Editor Workbook (which we displayed earlier). 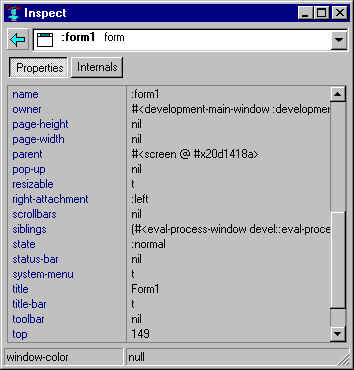 A skeleton function named form1-add-button-on-change is displayed. 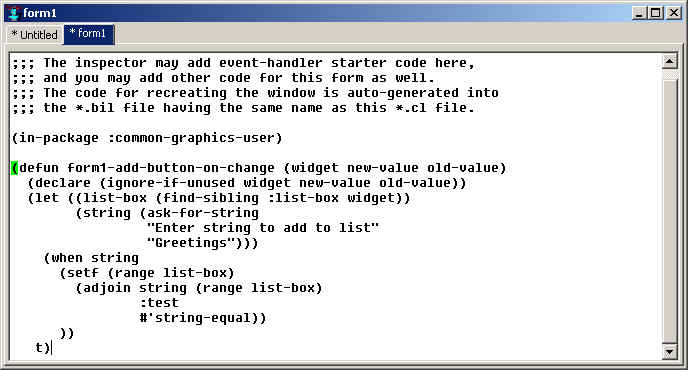 The name of the event handler combines the name of the form, the control, and the event. The cursor should be in the blank line in the middle of the function definition. Enter the following line. The modified editor should look like the illustration. Have the system evaluate the definition by placing the cursor in the definition or after the last parenthesis -- i.e. after t) -- and clicking Tools | Incremental Evaluation. Now test the form by running the project, which means creating the window designed by the form and running it so the controls are active. Click Run | Run Project. You will be prompted to save the project files. Do so if you want but saving it is not necessary yet. If you do save files, you are asked if you want to add the Untitled buffer to the project and what its name should be. Call it excode.cl -- do not worry about the file names now; we discuss them below in 3.2 Building an application. 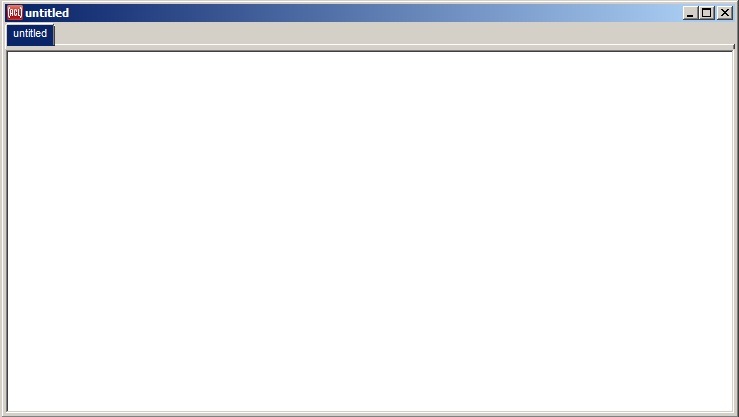 After you have saved the files or not, an active dialog appears. Note: if you did not display the form1 buffer in the editor workbook before clicking on the on-change extended editor button for :add-button, you may see redefinition warnings at this point. They result from the form1-add-button-on-change definition being stored and evaluated in a hidden buffer and they may be safely ignored. After you have saved the files or not, an active dialog appears. When you click on the Add button, a dialog asking for a string, with default Greetings, should appear. We show part of the form and the two dialogs. Modify the string or not and click on Okay. You won't see a visual change on the main dialog because we haven't done anything with the string just entered. We will now make use of it. Do not stop running the project. We are going to change its behavior while it is running by redefining the form1-add-button-on-change event handler. Add the following code, replacing all the current code below the declare line. The illustration shows the appearance after these lines are typed in. Note that the text is indented a couple of spaces and is indented after pasting in the editor buffer. It is important that no left parenthesis except the very first in a Lisp form (the one before defun in our window) be in the first column, or the editor will be confused about where the Lisp form actually begins. 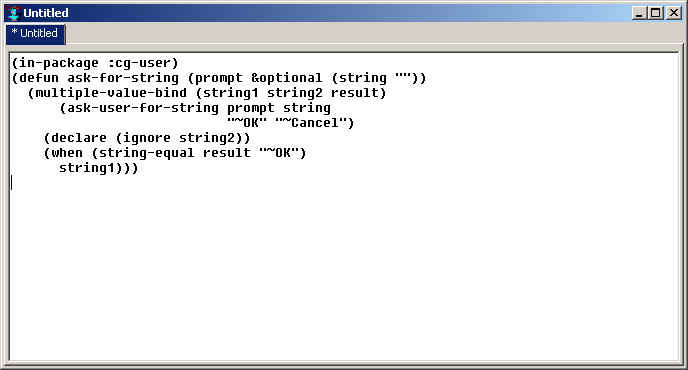 "Enter string to add to list"
Note that list-box was found using the function find-sibling and the name, :list-box. There are a number of find- functions. find-sibling is best in this case because only the other controls on the form have to be examined. This function now changes the range of list-box to include the entered string (adjoin adds an item to a list if it is not already there  if the new string is equal to a string already in the range, it is not added). Evaluate this in the system by placing the cursor in the definition or just after the final parenthesis and clicking Tools | Incremental Evaluation. Go back to the running form and click on the Add button. Again you are prompted for a string but now, when you enter one and click OK, the string is added to the single-item-list. We have added Greetings, Hello, and The quick brown fox. All appear in the illustration (The quick brown fox is truncated because we made no provision for lines that do not fit). We now have a dialog with the controls communicating with each other. And we were able to modify the behavior while the form was running. We can convert this simple example into a standalone application. Early in the example, we mentioned the Project manager window and used it (if needed) to display the blank form. Since then we haven't said much about projects. A project is a collection of modules associated with an application. With the modules and Allegro CL itself, you can build your application. Modules are parts of the application and have one or more associated files. Form1 is a module and has associated files form1.cl and form1.bil (we discuss these types of files in more detail in chapter 4). We have to be sure that the project contains all the modules necessary, form1 and the untitled (or excode.cl if you saved it) files. Lots of files are included in an application so we strongly recommend that you start with an empty folder (like the C:\allegro-projects\project1 subfolder suggested by the system early in this discussion). Save the files. (A project will not build unless all files are saved.) Click Files | Save All. This will save all unsaved files associated with the project. If asked, save form1.cl to C:\allegro-projects\project1\form1.cl and project1.lpr (the project file) to C:\allegro-projects\project1\project1.lpr. Build the application exe. Click File | Build Project exe. If you click Run the EXE File, the application will run. If you click OK, you return to the running Lisp and the IDE. Look in the C:\allegro-projects\project1 folder. You should see project1.exe and a bunch of other files. You can start project1.exe by double-clicking on it to run the application. End the application by clicking on the Close button of the dialog. 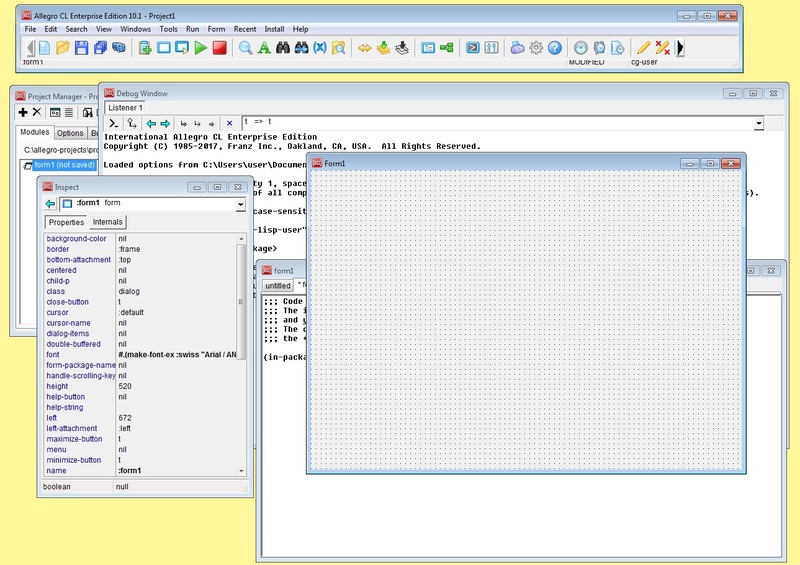 The Doodler tutorial is another application whose complete source is included with the IDE. 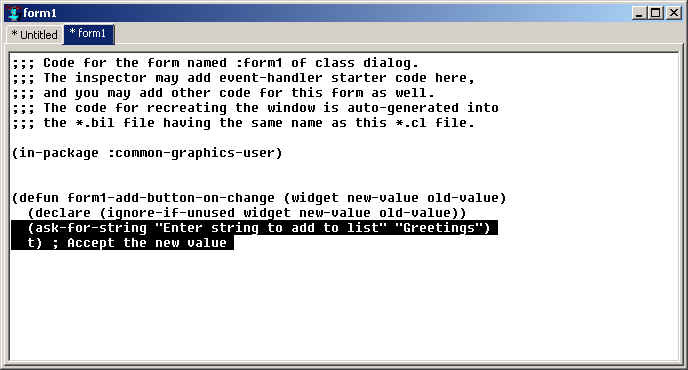 The tutorial illustrates features of the Allegro CL IDE. We recommend that you run the tutorial separately. Here we discuss features of the final product rather than taking you through it step by step. 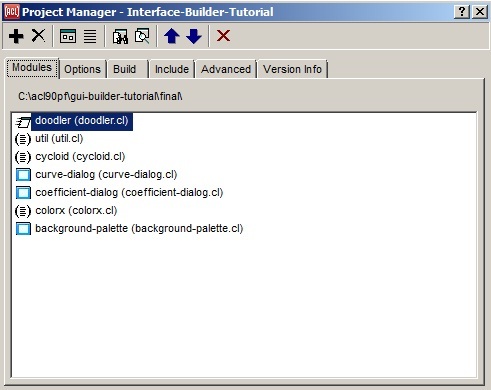 The code, examples, and so on can be found in the gui-builder-tutorial folder and its subfolders. We strongly recommend that you use the tutorial to familiarize yourself with the product. It exercises many of the features of the system, often showing more than one way to achieve a particular end. It provides many programming examples (already written). Our hope is that parts of the tutorial will give you examples that will be useful to you in your own program design. And the result is a program that is at least visually interesting even if it is not directly relevant to whatever application you want to write. and the main window upon which the specified curve or curves are drawn. Here are the elements of the project listed by the doodler project manager. We shall return to the doodler application as this chapter progresses. Now we discuss developing applications in general. Decide what the application should do. All applications start with initial data and initial input, accept additional input from the user while running, and display results based on the initial and runtime data. The results may be output continuously, or from time to time, or only at the end. We use `output' in a wide sense, including visual display on the screen, sound from speakers, control signals or messages to external devices run by the program, and printing of data to some sort of file. You must decide, broadly, what data your application will work on and what results will be displayed and how these results will be calculated. Write or procure the application engine. In the last line of step one, we say you must determine `how these results will be calculated'. We call the part of the program which calculates the results the `engine'. It is possible the engine is already available -- your task is to provide the user interface. Or maybe you have to write it yourself. The engine in interface-builder-tutorial draws the curve in the doodler window. A compiler is an engine, as is a searching program, a drawing program, an editor, and so on. Engines are usually rather simple, in that they take inputs and produce outputs. It is the job of the user interface to procure these inputs and make the outputs available in a useful form. Decide on what to do with the results. This step and the next (Decide on how to collect the input) can be done in either order, but providing inputs programmatically (for testing) is often easier and an application that cannot communicate results is useless. In this step, you decide on the format in which the output of the engine will be provided -- displayed as a picture or text, as sound from a speaker, as a data file or data output appropriate as input to another application, or as commands sent directly to a device. We will mostly focus on display of results. Writing to a file is usually fairly straightforward once you know what to write. The output for the interface-builder-tutorial application is the pretty picture, for example. It could also (or in addition) be a copy of the picture sent to your printer, a graphics file written to disk, or, if interface-builder-tutorial was a component of a larger application, a pixmap object passed to the larger application. Decide on how to collect the input. There are many ways to collect input: from a file, from another program, from the user directly. Reading from a file is usually not complicated. You just have to find the file and understand its format. Reading from another program is often harder (because interprocess communication is often complicated) but conceptually, at least, it is straightforward. Interactive input from the user will be the main focus of our discussion, both in this chapter and in this manual as a whole. 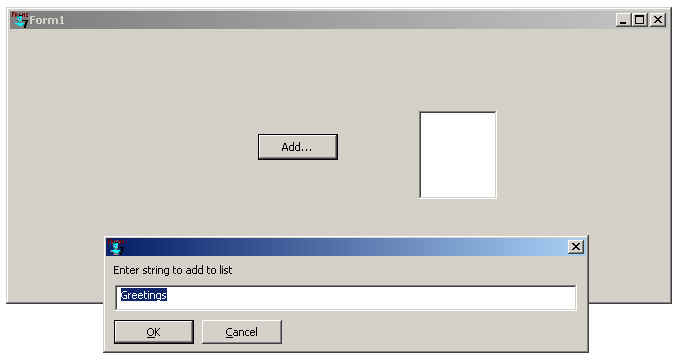 It also uses a color choice control that is a standard Windows dialog for choosing colors. 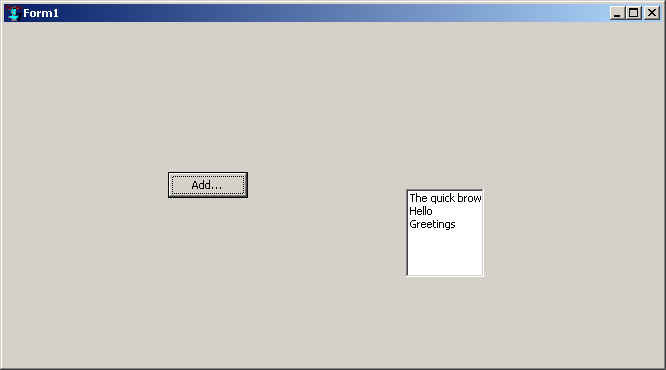 (Note: that dialog is not associated with one of the forms of the interface-builder-tutorial project. It is displayed by ask-user-for-color.) Many are designed for and can be used for collecting user input. User input from the mouse is still input. Implement 3 and 4. 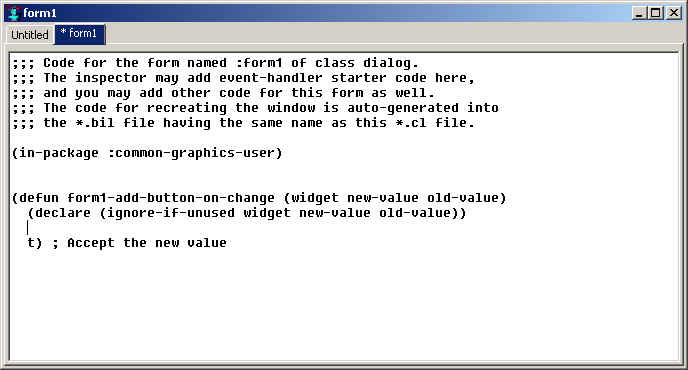 Much of the work of implementing collection of input (4) and display of output (3) can be done using the various tools supplied with the Allegro CL IDE, as we describe in this manual. Fiddle. One of the most powerful features of Allegro CL is that modifications are relatively easy and often can be done with a change in only one module while all others can be left alone. Decide what interface-builder-tutorial should do. Now, of course the real purpose of interface-builder-tutorial is to show off the features of the application-building tools available in Allegro CL, but that real purpose confuses our purpose. The apparent purpose (which we discuss here) is to draw pictures (of cycloid curves) in a window, allowing aesthetic enjoyment and obtaining information about how cycloid curves are affected by changes in the defining equation. Here are three curves differing only in the value of the A coefficient, 100, 200, and 300 for the smallest, middle, and largest curves. Write or procure the application engine. 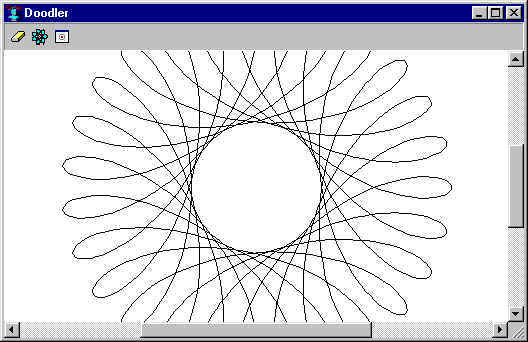 The engine in this application draws the specified curves. The file cycloid.cl contains the code which calculates the information necessary to draw the curves. (Curves like these are drawn by calculating the x and y coordinates of many points of the curve. The curve is drawn by connecting those dots.) Fortunately, this engine is provided and does not have to be written at this time. Decide on what to do with the results. The output is a drawing of one or more curves. This drawing could be printed or written to a bitmap file, or drawn on the screen. Doodler draws it on the screen. The background color of the drawing pane. How many curves to draw. The A, B, and C coefficients of each curve. The line color of each curve. Additionally, the user can erase the drawing pane, center the drawing pane, and scroll the drawing pane (all information about user desires that must be input somehow). 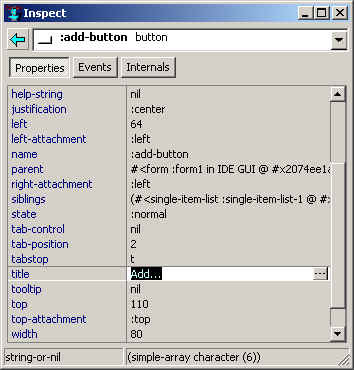 It is reasonable to have a window that lists all curves and allows the user to add and delete curves from that list. Another window can be used for specifying the details of each curve, and another for specifying the background color. 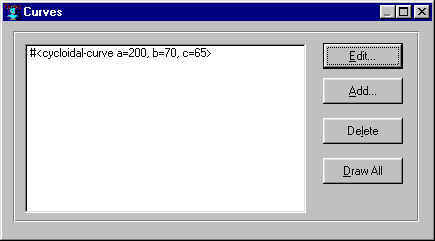 Finally, the user must somehow give the command to draw the specified curves. 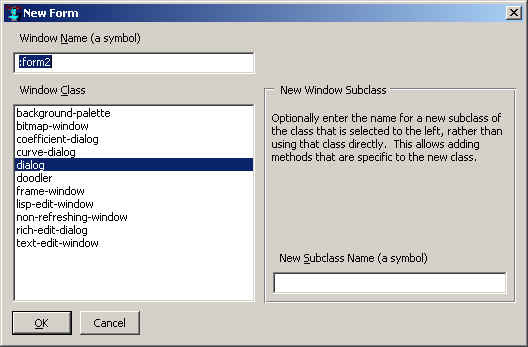 This arrangement (a description of the actual interface-builder-tutorial windows) is obviously one choice among many. 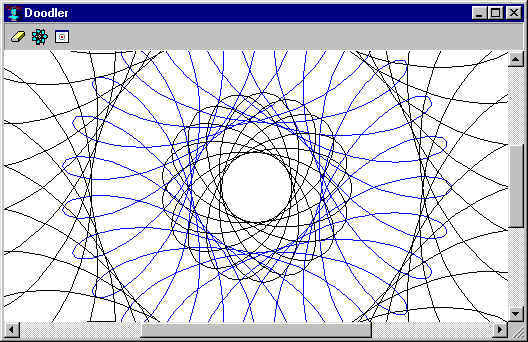 The draw command could be placed on the doodler window rather than on the curves window, or the erase button could be placed below the Draw All button on the curves window. The background color could be implemented by a Background Color button on the doodler window (that displayed a color choice dialog immediately) rather than having a background color window with a few choices and an option to get more choices. There are no end of possible arrangements, some being obviously unsatisfactory (dialogs for each coefficient rather than one dialog for all three) but many being equally satisfactory. Notice that this step is longer to describe that the others, because there are so many possibilities and so few reasons to strongly prefer one choice over another. Implement 3 and 4. The tutorial goes into great detail about implementing 3 and 4. We strongly recommend that you use the tutorial to learn the basics. In this chapter, we will discuss some details of implementing 3 and 4 as a way of describing how to do things that you will want to do in most all applications. However, we will not describe the process of creating the interface-builder-tutorial application step by step. Fiddle. In 4 above, we mention some choices which are not obviously better than other possibilities. Maybe the Draw All button should be on the doodler window itself, like the erase button, rather than on the curves window. One reason for this decision is the buttons on the doodler window have picture labels and there is no obvious icon for draw like there is for erase. (The button on the doodler window that might be draw, the one illustrating a drawn curve, actually displays the curve-dialog button.) Maybe there should not be a Background Color window at all, just a color button on the doodler window that directly displays the common color choice dialog. You can doubtless think of other possible changes, some of which would, from your point of view, improve the interface-builder-tutorial application. Note that the process of fiddling with an application typically adds features, capabilities, and choices, thereby increasing the application size and complexity and making it harder to maintain. There are four windows associated with the doodler application. Each window is designed by a form during the design process, so there are four forms in the interface-builder-tutorial project. This method is specialized to instances of the doodler class (and thus cannot affect any other window in the system). 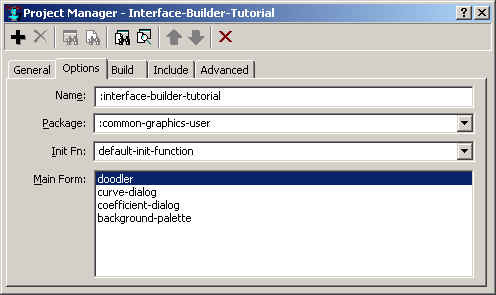 Without analyzing the code too closely, if the value of the doodler-curve-dialog slot is non-nil, it is assumed to be a curve-dialog and displayed; if it is nil, a curve-dialog is created and displayed. The argument to this method is the current window (a doodler window). Why are things done this way? The design is to have a button on the doodler window which, when clicked, displays the associated curve-dialog. This is implemented by having the system call show-curve-dialog with the parent (doodler) window as its argument when the button is clicked. That action displays (creating if necessary) a curve-dialog associated with the doodler window. The dialog knows which doodler window it is associated with (because that doodler window is its parent) and the doodler window knows which curve-dialog it has (because it is the value of the doodler-curve-dialog slot of the doodler window). Windows has provided many standard (called common) dialogs for common actions. One is the file choice dialog (a dialog that lets you pick a file on the system) that everyone is probably familiar with. Another is the color choice dialog. The background-color dialog allows a user to choose a background color for the doodler window. 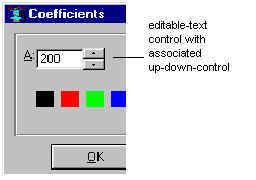 Several choices are provided along with a way to get many more choices and even make a custom color using a common color-choice dialog (clicking the Other Color button). ;; do not add color if it already is on the list. button is expanded to include the new color. The call to ask-user-for-color pops up a color choice dialog. The add-other-color function does what is necessary when a new color is chosen. You can mimic the code here when you want to pop up a common dialog and use the result of user action in your application. Go to chapter 4. Go to beginning of this chapter.